What better choice for a hot day than a white shirt? It is a basic item that every women should have in their wardrobe as it allows you to create many outfits. I've worn mine with a a pair of jeans and black pumps. A great choice for when you're not inspired to create elaborate outfits (just like I was that day haha). Great look hun! I love white shirts! so classic and polished! Love the detailing on the collar! Love how simple this outfit is. Very classic and crisp! Hi! Sure, we can follow each other. Just follow me and let me know, so I can follow right back! Beautiful, loving everything! I especially love the collar! Yes, I'd love to follow eachother! Just followed you! I followed you via gfc and bloglovin. Hi pretty! I like your blog and your style so much:) The shirt is super cute!!! you're so stylish dear! i love that topp! sorry dear, but i don't see your GFC button.. The simplicity of this post is perfection! I just realized that I was only following you on GFC! Thank you for your kind comments. I am your newest follower on bloglovin. In fact, I've shown lots of love (likes) on your wonderful bloglovin post! Hope you'll do the same! this is a great look for the summer! that's the perfect combo for everything! loved it! very nice and simply look! Nice look dear, basic items necessary in every wardrobe!! You get a feminine outfit with these clothes. Great job! I love it! simple but stylish! Simple but chic- perfect. I think your blog is just lovely. Would you like to follow each other? Just let me know on my blog if you would like to! Very cute outfit! of course we can follow each others dera! Follow you! xo! Beautiful look! I would love to follow each other, following you via gfc and bloglovin now! Un look perfecto y muy bonito. Love your minimal outfit! Would you like to follow each other via GFC, bloglovin' and facebook? You have a great blog and I am going to follow you! This outfit such a simplest chic! white top and jeans are always Chiclet looking! What amazing outfit! love it! xo! I love your look! It's so simple but it works really well. btw, blogul este foarte fragut asa ca te urmaresc !! Thank you for your comment in my blog and for following me! I'm following you back on GFC and Bloglovin! Nice and elegant look ;)! Hi and thanks for visit and following. this outfit is very simple, but super super classy! 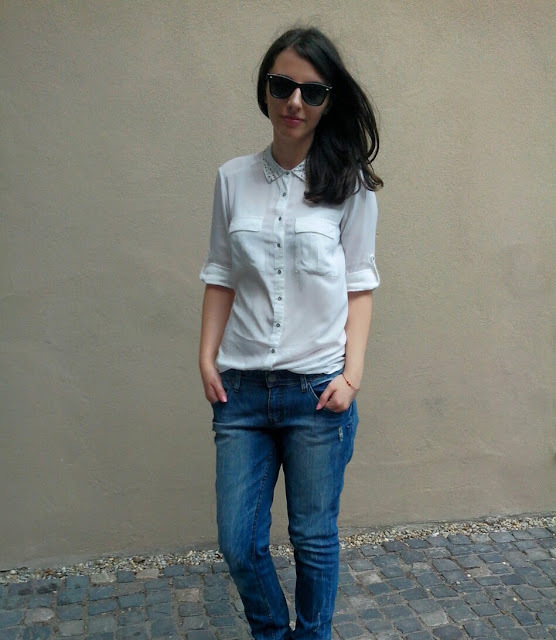 I love the contrast of the elegant button-down and the heels, with the slouchy jeans.